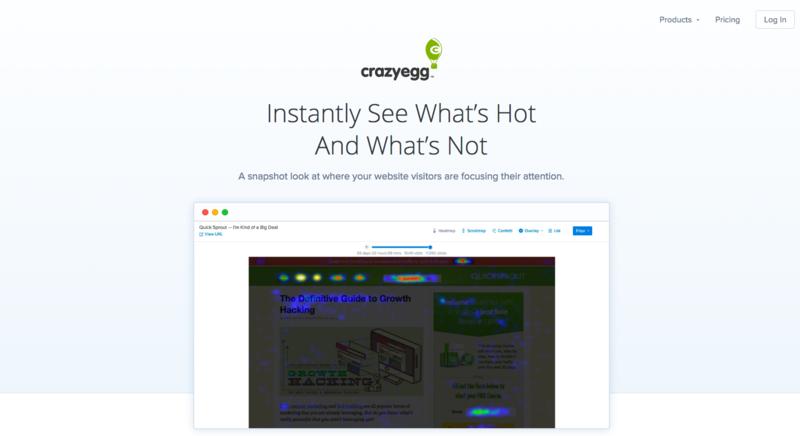 HotJar vs. Crazy Egg: Which Heatmapping Tool is Best For Your Website? After launching the new Web Ascender website in March, we tried using a few different tracking tools to see where our visitors were scrolling and clicking. This allowed us to better assess the new content and features we added to continuously improve upon our website. We tried out two of the top heatmapping tools, HotJar and Crazy Egg, and both had their pros and cons. In this post we’ll share our experience with the ease of use, features, cost of these heatmapping tools and what our ultimate recommendation is. Hotjar, the first heatmapping tool we used, was branded as an “all-in-one analytics & feedback” tool. Its analysis features included: heatmaps, recordings, funnels, and forms. Its feedback tools included: incoming feedback, polls, surveys, and recruiting. 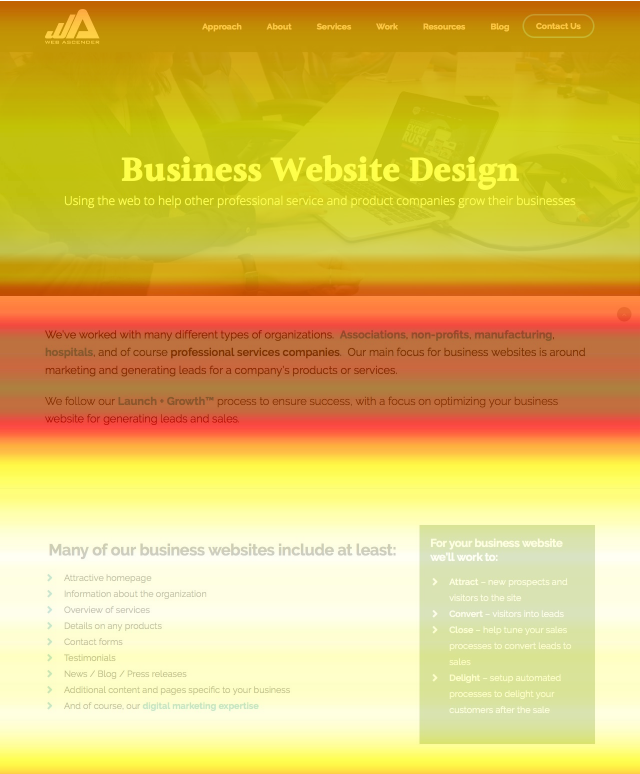 When we used the service, we focused on using the heatmaps, so I can’t say too much about the other features. We ultimately liked the product but were curious what else was out there, and the different data we could collect by opting for a different heatmapping tool. Crazy Egg separated its features into three areas: snapshots (heatmaps and scrollmaps), recordings, and an editor. Once again, we focused our efforts mainly on the snapshots. Installing Hotjar and Crazy Egg heatmapping tool onto our site was a simple process: both services gave you a piece of code that could be added directly in the header of your site. Overall, both were very easy to use and understand, but there were a couple of downsides to each program. For example, in Crazy Egg, the scrollmap scale took a while to get used to. There were also potential issues with Crazy Egg where you could see snapshots on desktop and mobile, but they would each count as a different snapshot. You could still record data from desktop and mobile on one snapshot, but only have it displayed on either the desktop or mobile version of your site separately. This could pose as a problem if you had a plan with limited snapshots and wanted to see both desktop and mobile views. In Hotjar, you could see desktop, tablet, and mobile views all in one screenshot, which was great. In general, however, Crazy Egg felt like a more cohesive product. It seemed like they knew their goals and didn’t feel the need to add too many extra features. Hotjar had quite a few features, which wasn’t bad, but if you were just looking for heatmaps, they probably weren’t necessary. It might’ve been nice if you could opt for just the Analysis tools, for a cheaper price, rather than all of them. As stated above, when we used Hotjar, we only used a couple of the features, leaving the others untouched which made opting for a paid plan hard to justify. The heat mapping between Hotjar and Crazy Egg were very similar. Hotjar had an advantage in a couple respects. First, instead of only showing mouse clicks, it also showed where the mouse moved on the page. Second, to see how many clicks each link or area had, you could just hover over the area. In Crazy Egg, you would have to go to a different view to get this information. However, Crazy Egg had a feature that, in my opinion, made up for these small downfalls. There was a “confetti” view that allowed you to sort clicks into different categories, for example: referrer, new vs returning visitors, country, browser, day of the week, and more. These were really interesting and helped us easily see differences between groups of visitors. Hotjar and Crazy Egg both had scrollmaps, but they both functioned differently. In Hotjar, the scrollmaps represented how far down the page visitors went. It started off red, then faded to orange, yellow, and so on based on where visitors got to on the page before leaving. On the other hand, Crazy Egg scrollmaps represented how long visitors spent on different parts of the page. The color-coding was also a bit different: white was the hottest, then yellow, then red. This was a bit confusing when first using the scrollmaps. Both styles of scrollmaps were useful in different ways; if only one of the services had both! Each service had different pricing levels, starting with a free (but very basic) Hotjar personal plan and going all the way up to a Crazy Egg plan for large businesses at almost $1000/month. Choosing a plan that’s right for you depends on the size of your website, the amount of visitors you get, and how many features you want. One thing to keep in mind is that Crazy Egg requires that you pay per year, which can be a bit of a turn-off. With Hotjar however, you can cancel at any time, as well as upgrade or downgrade your plan at any time. 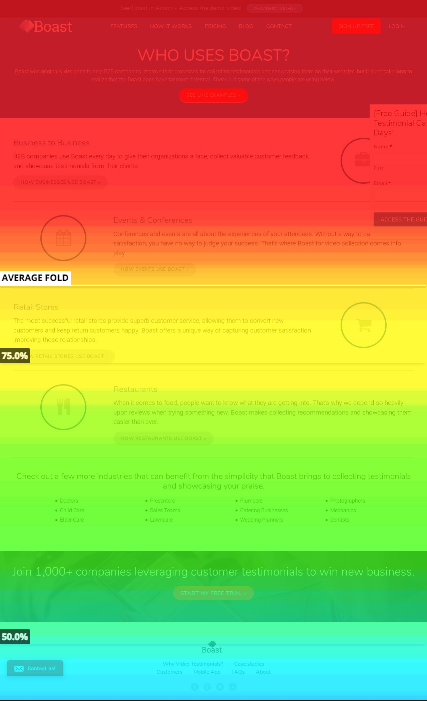 Which heatmapping tool should you pick? Both Crazy Egg and Hotjar offer free trials for their plans. Give both a try, and see which fits your needs better.